For many the “Why Automate” is taken as a given, the main question becomes “When” should automation be implemented. At the start of the day there is a pile of work to do. Well actually, for many there is no paper, it is normally a lot of emails in an Inbox, or a list in a spreadsheet, or a set of tasks in a workflow application. By the end of the day, after lots of activity on the computer, tasks have been completed and you can go home satisfied that the activities have been achieved. The next day will be similar and fairly predictable. Many organisations are aware of RSI – Repetitive Strain Injury. When people encounter RSI, the impact on their lives can be significant. For most people, RSI occurs in a work context which is why good employers have the topic covered in their HR policies. The two most common situations where RSI occurs are for workers on manufacturing production lines and for workers who spend their day on computer activity. Why do businesses need to automate? How much repetition in your week? At the end of the week, as you think about what you have done, how much repetition has there been? Looking forward to next week, are the things you have done this week going to be repeated? 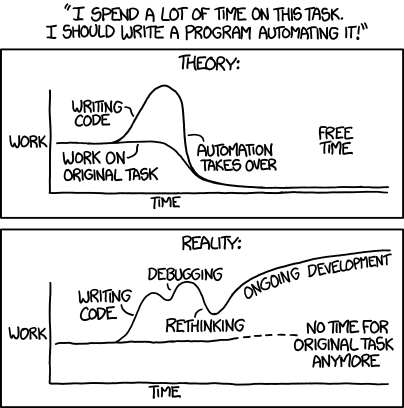 Sometimes we pretend to ourselves that we and our colleagues, are doing different things, but actually the tasks / activities are the same it is just the data we are processing on the computer system is different.